Homesteads designed to increase self-suffiency are not just a throwback to the 60’s or a prepper fortification against total breakdown. In today’s uncertain world, they are investments in personal and local resiliency that offer substantial returns in any future scenario. And it doesn’t take much land to shift your family’s balance from total dependence on unsustainable (and potentially fragile) global food and energy systems, toward a much more rewarding and reliable balance of local, regional, and global supplies. After a few years, you may even find yourself feeling a lot less nervous about the “what if” consequences of a major economic or environmental crisis that could disrupt your access to distant goods. But where to start? And why would you want to? We recently came across a great introduction to these questions, in a profile of Melliodora, a 2-acre homestead in a rural village setting; click through for more details. Two of the Resilient Investor authors, Michael and Christopher, are longtime permaculture teachers, while Hal and Jim have both incorporated some permaculture design on their edge-of-town lots. While none of us are envisioning a sudden or catastrophic societal breakdown, we all have found it to be worth our while to invest some money (and quite a bit of time) in setting up systems in and around our homes that reduce (but don’t eliminate) our reliance on regional and national supplies of food, water, and energy. It’s a long-term process to gradually become more self-sufficient, and each of us is continuing to assess how much to prioritize and invest in these systems. The benefits are manifold: reducing annual expenditures, providing an impetus to get outside and enjoy the morning and evening beauty of our land, sharing projects and skill-building with family members and neighbors, and providing at least the start of a more significant hedge against future disruptions. The urban-rural fringe is an edge where the resources of both the city and the country are accessible. The location of the land and its relationship to both town services and the surrounding natural and community environment affect its potential as much as the natural characteristics of the land. 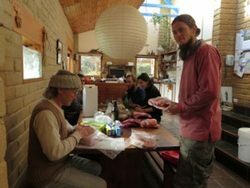 These quotes all come from a brief but comprehensive introduction to the Melliodora approach to homesteading recently published by the Permaculture Apprentice website. There you can also find a series of shorter profiles of homestead projects ranging from a tenth of an acre to a hundred acres in size. And, for the full story on Holmgren’s approach, we can recommend his book (now also a PDF e-book) highly enough: Melliodora: A Case Study in Cool-climate Permaculture.